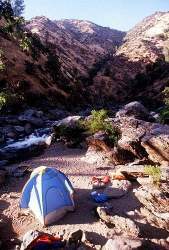 Camping is one of the most popular recreational activities in Stanislaus National Forest. There are 12 riverside campsites available for whitewater rafters, and 4 additional campsites designated for commercial whitewater rafting companies. There are also 3 National Forest campgrounds. All campgrounds and riverside campsites are on a first come - first serve basis. "Don't try to carry camping gear down Cherry Creek. Camp at Lumsden Bridge Campground (right bank, just downstream from the bridge) or at other sites near the road. Get an early start. If darkness catches you on the river, tie up the boats, climb up the right bank to Lumsden road and finish the run in the morning." 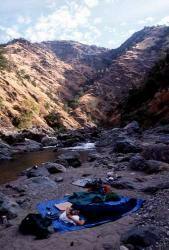 There are 12 campsites which can be utilized by whitewater rafters within the Wild and Scenic Tuolumne river canyon. Check with the Groveland Ranger District for more information about these campsites. Note: All mileage's are taken from Meral's Pool River Access. The following four campsites are reserved for commercial rafting trips on a first-come, first-serve basis. However these campsites can be used by non-commercial rafters if they are not need by commercial rafting companies. Check with commercial trips at Meral's Pool put-in to see which commercial sites might be available. Note: All mileage's are taken from Meral's Pool River Access. The Wild and Scenic Tuolumne River has three developed campgrounds which are managed by the USFS Groveland District. All campsites have vault toilets, picnic tables and grills. 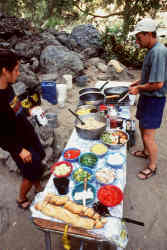 The Above Forest Service campgrounds are FREE to use on a first come - first serve basis. Motorhomes and vehicles with trailers are not recommended in some campgrounds; the access roads are steep and rutted. Electric and sewer hookups are not available. Maximum number of people per campsite is 6 and the maximum stay is 14 days. Lumsden and Lumsden Bridge Camps are open year round, and South Fork Camp is open from April 15 - October 15.